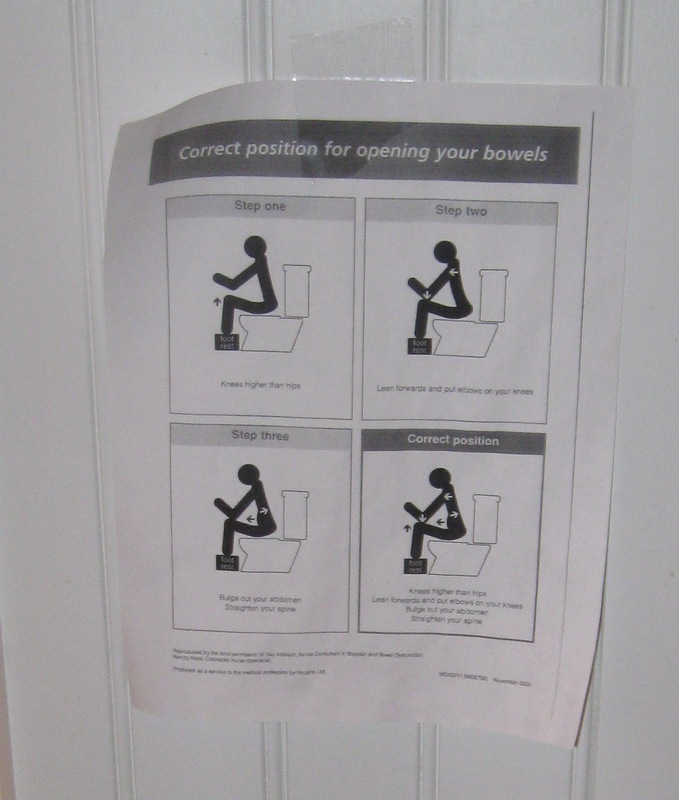 Most of us don’t spend a lot of time thinking about our bowel movements – but how you position yourself while you eliminate makes a big difference in your health. Better yet, you can regularly achieve the elusive one-wiper! Proper pooping is done in a “squat” position, which isn’t possible on an unmodified modern toilet. You will need a “poop box” or “poop stool.” The most succinct and entertaining explanation I’ve seen on this subject is the following video by Underground Wellness. I personally (of course) use a five gallon bucket as a poop stool. Standard five gallon buckets are a little tall, so I use a shorter, wider model. 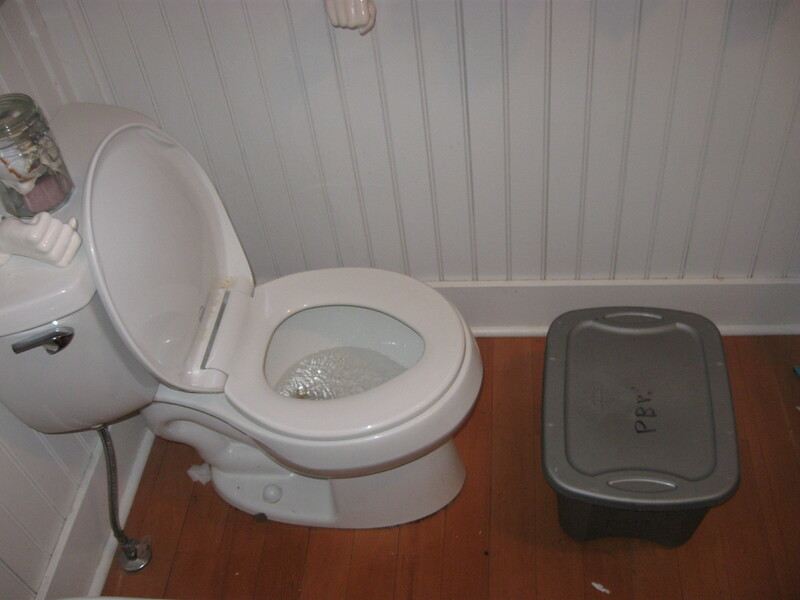 (The exact unit pictured here in my bathroom is the Sterilite five gallon tote.) Not only does it help our bowel eliminations go smoother, but it stores our toilet paper and other bathroom accessories as well! 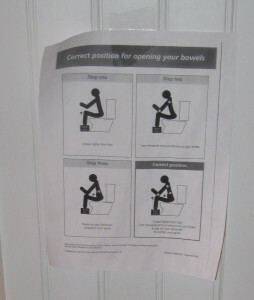 As part of my proper pooping evangelism, I post this simple “correct position for opening your bowels” infographic prominently in front of the toilet. I’ve had about half a dozen people use my bathroom, see this sign, laugh out loud, try it anyway, then adopt the method in their own bathroom. At the bottom of this article, I’ve placed a download link so you can print out your own copy of this important chart! Update: A colon-conscious entrepreneur has invented the Squatty Potty” – a more aesthetically pleasing version of the poop stool. Their website has links to a number of testimonials and medical research on proper pooping. It stows away right under the toilet, taking up less floor space. It’s strong enough to put your weight on, which helps you achieve a better squat. 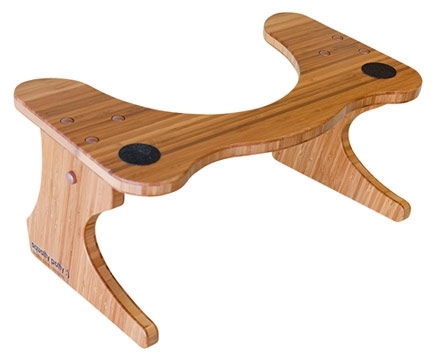 You can read more about their stool on their website. Free download: Get the elimination diagram that I use in my bathroom to change the bathroom habits of my guests. This one printout could improve the lifespan of your entire family! Brilliant! Thanks for writing about this. Not a very popular topic I’m afraid. Unfortunately this critical info. is mostly forgotten in the west, rarely if ever taught, thus never learned. So, Thanks for sharing/teaching. I really hadn’t thought about this much, but it does make sense! I use the kids’ little step that I bought so they can reach the potty and sink. Never really thought I was improving my movement, I just did it because I have short legs and it’s more comfortable. I will definitely be sharing this. I love Sean’s video! I work on a traveling show with performers from all over the globe. One year we had a troupe of young ladies from china. I was always puzzled when they would go into the bathroom and you would see their feet disappear from under the stall door. As it turns out, a lot of the toilets in china are flush with the floor so you just squat over it to do your business. The girls who were used to this would squat on the toilet seat when faced with our american toilets. I should mention these girls were acrobats and maybe posessed better balance than most. But it looks like they were onto something. 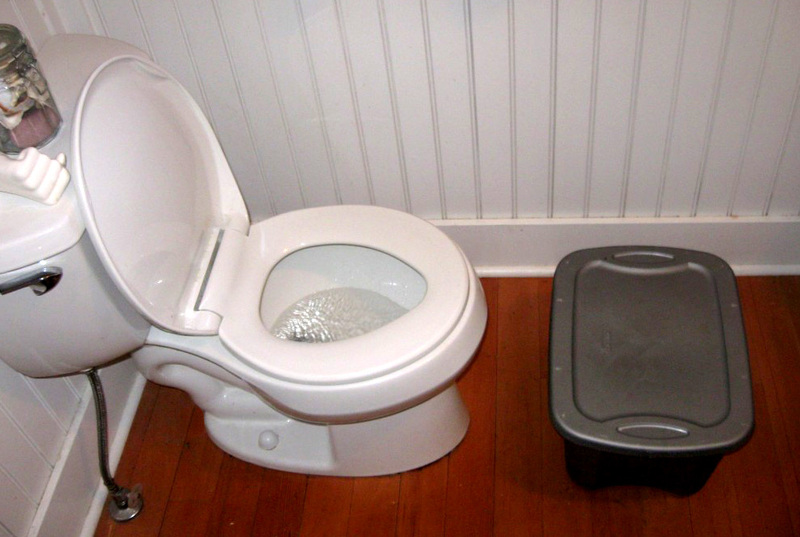 Most of the world uses a floor toilet which requires squatting. This is why I fly to Japan to take all my shits. Best comment left on this website so far. Jason made me laugh. I say, ” I’m going to the library.” I’m going to have to try this method to speed up my reading. Hello, just seen the tip on the FauxShow, I will try it out soon, not because I care of my health, but because of my laziness of getting to the store like 3 times a month for toilet paper! That’s a good enough reason for me! Ha, well I guess that makes sense… Certainly makes for a good headline! The Squatty Potty looks good for what it is, although it might eventually get dirty. Superb Idea, lot many indian toilets are at the floor level. american toilets got introduced into the indian home due to more of elderly persons having knee pain hence they could not squat lifting them from that position was another task. In the medical field, poop is referred to as “stool” – so I guess an alternate name could be a “stool stool”!? The moment I picked up a toilet stool to poop was the moment life changed forever. Now, if I don’t have my toilet stool, I find myself doing a tip-toe dance on the toilet to try and replicate that position. Then my legs start shaking from the amount of time spent doing it! 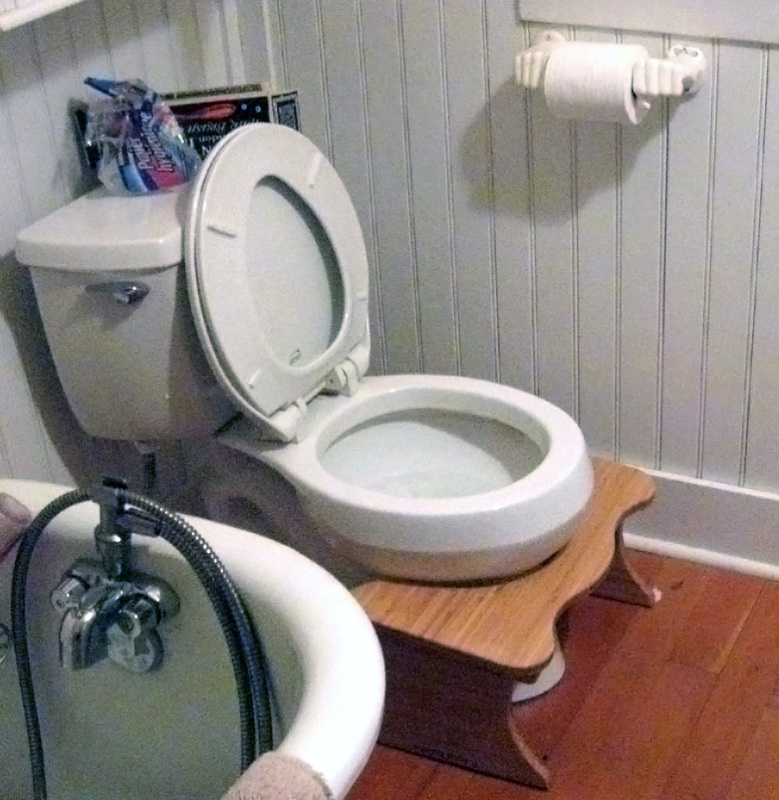 Toilet stools should be everywhere!